Ok… So I know in the picture I look like a bit of a monster, but I swear this has been one of my beauty secrets over the years, and I hope it helps some of you. First off, you should know that I have VERY dry skin. Like, I regularly resemble a snake during shedding, and I am still trying to find the perfect skincare line for my skintype. I don’t get acne really, the odd zit here and there, but I have a colony of blackheads surrounded by dry skin. It is very difficult to find a way to hydrate my dry skin, while trying to unclog my oily pores, but we will get to that in a different blog post. I used to spend upwards of $50 per bottle of a top of the line exfoliant, until I tried this little trick and never went back! Take two spoonfuls of your used coffee grinds, and two spoonfuls of olive oil in the palm of your hand. 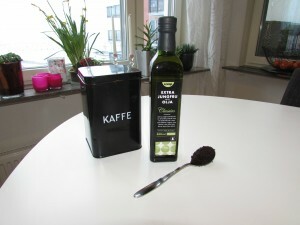 Massage the coffee grinds and oil together using your fingers, until you form a paste. *Do this over the bathroom sink, as it can be quite messy. Carefully smooth onto skin avoiding eyes, lips, and ears. 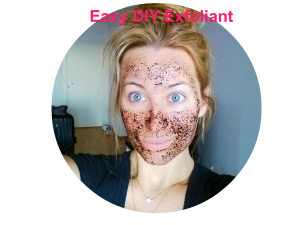 I like to leave the paste on my skin for 5 minutes so the oil soaks in, and the caffeine from the coffee grinds has the chance to enter my skin (great for anti-aging). After about 5 minutes, GENTLY massage the paste into your skin. I can’t emphasize being GENTLE enough. You DO NOT want to damage your skin here, and you’d be surprised how delicate your face is. (I always think of it as tissue paper). Once you’ve exfoliated your dry spots, (for me I always do forehead, cheeks, chin, and nose), wash the paste off. Be careful, as the coffee grinds can get into your eyes. You do not want that, so take your time. Moisturizing isn’t necessary as the oil acts as a natural moisturizer, but if you are going outside, ensure you put on some sort of SPF as your skin will be more sensitive. I tend to get a little red after exfoliating, but it goes away on it’s own within 20 minutes. See the video below to get a clue on how to do the whole process! Questions? Comments? Let me know if this works for you! Gosh, I feel like a snake too! I’m going to try it for sure. Im definitely going to try this out! Thanks for sharing! p.s I live in Hamilton, Ontario so I feel like the weather is tough on the skin. haha.